Features extremely detailed cockpit with fully simulated FMC, complete TCAS simulation with audio and visual TA and RA system. Also fully simulated Inertial Reference System. 90% of 3D fully operational buttons in VC mode. Three model configuration for better performance. Included are seven liveries. By the iFly Developer Team. IMPORTANT: The iFly 747-400 WILL NOT FUNCTION PROPERLY without FSUIPC4 4.12 or higher. Open FSUIPC4.zip, follow the instruction and install FSUIPC. We recommend to update the navigation database from NavData, we use the same database as pic767/pmdg737. We also recommend updating the updating database from PlanePath. This product is only compatible with FSX, so of course, FSX is required. For your computer, we recommend you have a P4 2.8 GHz machine, with a 256 Mb memory video card. System memory should be a minimum of 1G. HD should be a minimum of 250MB. Low-end onboard sound chips are NOT recommended. A plugin sound card, such as a Soundblaster Audigy, is recommended. Q1. I have installed the FSUIPC. however, all displays in the cockpit don't show anything except on PFD says that I need to install FSUIPC with version number 4.1. Why? A: If you already have FSUIPC version 4.1 or later, then this problem indicates that you are using unauthorized FSUIPC registration code. However, actually, you don't need to use a registered copy of FSUIPC for iFly 747-400 (because iFly 747-400 can function normally with an unregistered copy of FSUIPC). The solution is to simply re-install the FSUIPC. Q2. The sound volume seems quite low after I entered in iFly 747-400 2D cockpit. How to fix this? A: Select the FS menu to "select aircraft", and select iFly 747-400 to load this aircraft again. A: In some special cases, the GS station in FSX gives incorrect coordinates (due to FSX's own problem). You can select NAV RAD page in CDU, and insert any frequency to NAV 1, then insert "DELETE" to delete this frequency. By this way, it can force FS to refresh the GS's coordinates. Please note, it is not recommended to use this method in SLEW mode or in PAUSE state. Q4. Why there is nothing shown on displays in VC mode? A: It is possible that your default flying setting is to use VC mode. You need to first 2D cockpit and then switch to VC, so after the displays in VC mode should function normally. The archive fly74711.zip has 34 files and directories contained within it. Should you be anything like myself, then you will have no doubt spent a lot of time recently looking into trying to find yourself a remake of the Boeing 747-400 for use with Flight Simulator X. as one of the best flight simulators around, it only makes sense that you want some of the most prominent and important aircraft of all time to be represented! Well, this package gives you that representation that you were looking for in abundance. By making sure that you have all the help in the world in getting right into the spirit of the Boeing, this package includes every possible feature that could have been implemented. As a Boeing fan myself it was heartening to see every possible feature included with stunning detail and accuracy. The extensive operations manual – for a flight geek, it was great to read over 300 pages of intricate and factually correct information about the Boeing 747 and how to fly it properly! Gives you all of the little additions and features you would hope to see from a recreation of the Boeing 747 – including an Inertial Reference System! Overall, the absolutely staggering list of features that ha been included makes sure that you have an aircraft that feels like the real thing. Having had the enjoyment of flying in a 747 on many different occasions over the years, this feels just like the real thing. From the features and the way it actually flies to the sounds that it makes, this is a perfect recreation in my opinion. Looking for a way to spice up FSX and ensure you’ve got hours’ worth of simulation left out there? Then you need to have this package included – it gives you literally everything you need. I do not know how use external power. Sometimes it appears, sometimes not. What do I need to do to appear? When I saw tutorials they use FMC, but in this version doesnt have this option. Great freeware 747 addon. It's not as good as payware quality but it does come close. Did as instructed for VC and it still doesn't work. Any suggestions? Also says I don't need a subscription for FSUICP but it keeps asking for one and won't let me do anything. What's up with that? I concur. The best 747 freeware adon I have ever flown. Thanks! When I try to download any aircraft I get a message telling me that the download is not 32bit download. And yet I am running windows 7 64 bit. I have followed the intructions, still no VC. I have FSUIPC4.939 installed. Please, some assistance would be of great value. This is not a comment but a question. Does this software work with Microsoft FSX Steam version? The iFly documentation installs in your FSX directory under an "iFly" folder, not in the airplanes directory nor a documents directory. well what can I say , hum. I have PMDG,777-200-300ext ,747-400, MD-11 fsx most of the airbuses 318.320 ect A-380 you get the point , Well now comes IFly Just when you thought you had all your birds in a cage ,I saw your introductory video of this bird and know I had to have it . I just installed it and this baby is the sh-- no joke serious sh-- if you don.t have it you can,t fill in the blanks. However if you do you'll know what I'm saying, Trust me I know my planes and this one has moved to the top of the list and if it where not so , I would simply say so. over and out. 8. Operations Manual with 330 pages? But where can I find this 330 pages manual? Download and working OK, but I want to know how to use the FMS and IRS? I use FSX SE, installed it just as instructed. No sign of it at all when I look for it in aircraft. Help Please? Why or how do I get the manual?? Program downloaded okay....no manuals. Have a problem, need help. How do you shut off the engines once a flight is complete. I can only get engines 2 and 3 to turn off but engines 1 and 4 continue to try and re-light and continuous ignition is turned off. Also is there service pack updates and if so where do I find those. I have no VC AF all, the 2D cockpit works fine but when you switch to the VC all you can see is the scenery ahead. Can anyone help please? Wow, several models, detailed 350 plus page manual, claims of realism, tons of eye candy. Too bad the aircraft doesn't work. Undocumented procedure to make the VC and 2D panel displays and gauges to work: View Instruments, DUMMP, then after everything loads switch views. Panel displays and gauges should work now, until you change aircraft of exit FSX. REQUIRES PAID VERSION OF FSUIPC for many functions to work as described in the manual, and to program the FMC. FMC uses ONLY seriously outdated AIRACS BGL files (they were 10 years outdated when this aircraft was released). This makes the aircraft unusable in multiplayer flights using VATSIM and IVAO, and even in the now defunct Gamespy. If you have updated these files in FSX at all, you will need to uninstall FSX, then reinstall without ANY updates, to create the two flightplans so they work together. Flight planning requires both FSX Flight Planner AND the FMC be programmed manually, they don't talk to each other, and the aircraft will either stall, refuse to climb, or dive for the ground if you don't. I've been using MSFS since the original version (1980's). Never once have I come across a "freeware" aircraft so ridiculous. My guess is it was intended to be a demo for an internally proposed project, one that flopped badly. Only serious simmers pay for aircraft, and then we only buy them from serious developers. My advice? Don't bother with this one, it isn't worth it. Can this 747-400 be flown without having to use the FMC like the FSX default 747-400 using the GPS, NAV and Auto Pilot. When I select F9, I have no VC. All I see is Runway. 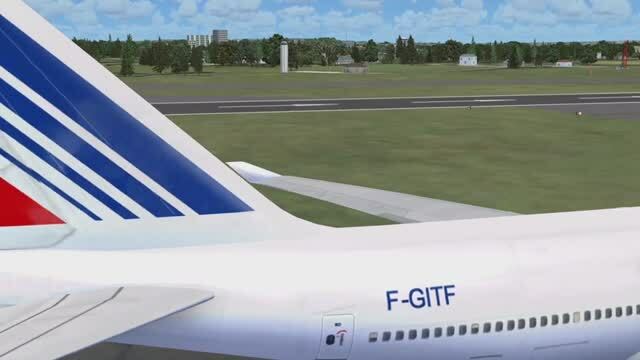 IMHO this is the top add on for FSX. It set's the standard for freeware add ons for FSX. Just make sure you run FSX in administrator mode to use the FMC. It's auto land capability is the best there is. I can land this plane in fully auopilot in zero visibility, just like a real Cat III C landing. That is simulated very well with this model. guages ect didn't work, put MS 747 dash in it works, then aircraft sinks with stick all the way back. Every aircraft in this site has problems with something. WOW!! It takes flying to a whole new level! Great job!